Until, that is, a statue seemingly memorializing the duo becomes the duo! 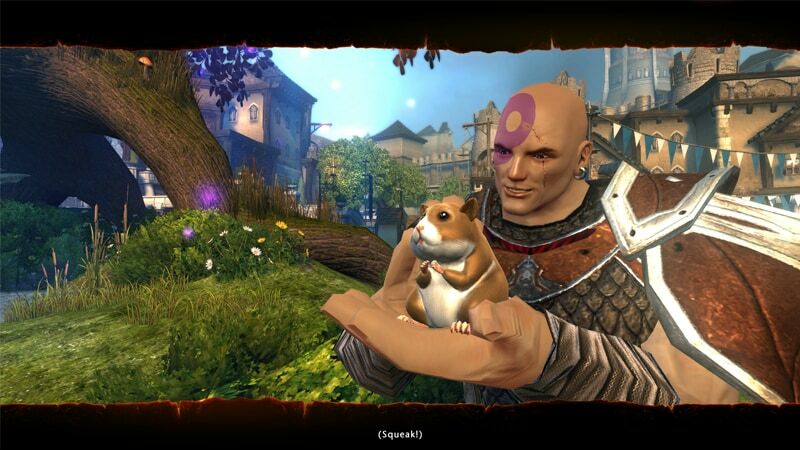 After the undoing of some errant magic from long ago, Minsc and Boo are back in the Forgotten Realms. Freed from captivity, the do-gooders set right back out on their path to fight evil wherever it may be found. Neverwinter’s perpetual unrest is a perfect destination for Minsc and Boo, but they arrive to find the great city has been beset by the cults of Elemental Evil. Evil you say?! As the Cults establish beacons across the land, the elements and all of nature are disrupted. But not without the Emerald Enclave noticing. This organization of druids has taken interest in the Sword Coast, opposing the Dragon Cults’ attempt to free Tiamat. Archdruid Morningdawn arrives in Neverwinter bearing the gift of the Tree of Elemental Balance, a prominent new feature in Protector’s Enclave. Working with Minsc and Boo, players will seek out seeds cultists are hoarding to feed to the Tree of Elemental Balance to aid in Neverwinter’s defense. Minsc’s spirited approach to annihilating evil quickly turns the hunter-ranger into a detective, scouring the lands surrounding Neverwinter for clues to the Cults’ power. Join Minsc and Boo on April 7th to wage war against the Cults of Elemental Evil!